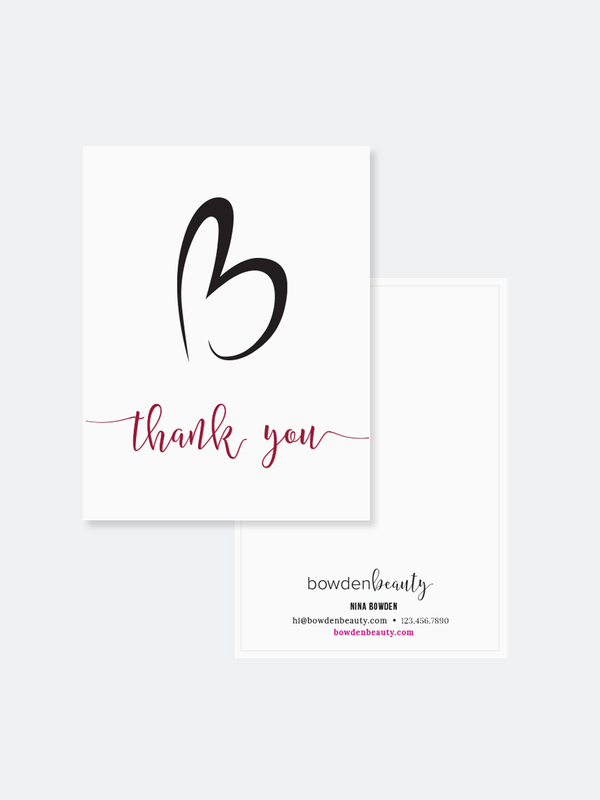 Bowden Beauty — Garriott Design Co.
Nina is a fellow military spouse so I was happy to work with her on her company, Bowden Beauty. Nina is a makeup artist for everything from weddings to photo shoots. Her micro business is located in the Seattle and Tacoma area. I knew a feminine approach was assumed, but I decided to give the brand its own spin by creating a combination of a capital B and a heart by hand, combined with complimentary delicate calligraphy in the wordmark. The color palette features a bright fuschia grounded by a darker mauve, black, and white. The combinations between these were a lot of fun to explore in her website and printed collateral. The heavy use of black helped in giving the brand a unique separation from a typical beauty brand. Nina’s business cards feature gold foil on black. Nina wanted to create thank you cards to add a personal touch to her services, which she sends out after a booking thanking the client and reminding them that a referral is the greatest compliment. Due to the nature of her role in events, Nina is fortunate to have tons of professional photographs of her working and the finished looks. Having curated, branded photographs is a wonderful way to set your website apart from others.